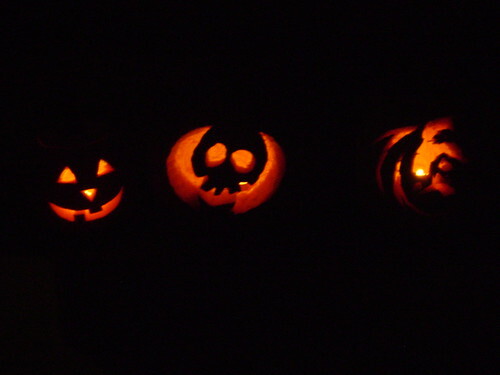 Ethan’s, Megan’s, and Rachael’s carving artistry. Do not create apple pie. I really dislike creating apple pie. Create basket of goodies to “boo” our neigbors. We got boo-ed two weeks ago, and have still failed to respond. I know. Ungracious. Create stylish yet casually coordinating outfits for family pictures on Saturday morning. First must purchase such outfits. Create more money in my checking account. I am not a creative person. I know many of you reading this are. Help! And pardon my french (and the pun), but what the freak is going on? When did Halloween become a quasi-Christmas, complete with a checklist, baking and stress? Am I the only one feeling the heat? (I doubt it.) Despite the to-dos, I think we’ll still have fun. Or at least my kids will. Hope you do, too. Next Article The best line of Thursday night T.V. I love Halloween. I think the Boo thing is a bad idea. I totally hold it till the night before. No one wants to have to reciprocate. Hope you got through it all. Our Halloween ended up to be pretty low key-don't know why-but I'm grateful after reading your heinous list! Let the Thanksgiving/Christmas joy come baby! Sorry Jen!!! Cut some of that out – we should mail you some scrubs for costumes – they are great backup costumes – Morgan and Maxwell are in scrubs this year! I didn't decorate for out TT this year – I am lame and didn't care 🙂 I am on the hunt for family pic clothes too – not for two weeks! Let me know what you find so we can can copy. You are making me tired! Just say no or at least not this time!!! I love the list actually! Why don't I have that much to do for Halloween? Now you're making me feel like a loser. I'm really glad you posted this list. I totally forgot about doing the cupcakes! We would have been 24 too short. Now my list just got totally impossible. What's a girl to do? I hear ya sistah! I've had 2 meetings so far this week to plan our adult Halloween party, made chili, made cookies, still need to hem costumes, soccer games/practice continues, and so on and all the girls in our family have come down with this horrendous cold which does not put me in the mood to do any of the above, but in the end it will all be fun, right? Good luck! BTW, I have some delicious chili recipes should you need them…call me! I went 'round and 'round trying to fix the double spacing on this thing. Sorry!